Pardus is a GNU/Linux distribution funded and developed by the Scientific & Technological Research Council of Turkey. Pardus has a range of unique features, such as Mudur, a start-up framework of Pardus to speed up the boot process, and PiSi, an efficient package management system with a user-friendly graphical interface. The official web site of Pardus features the following as highlights of Pardus Linux 2007. 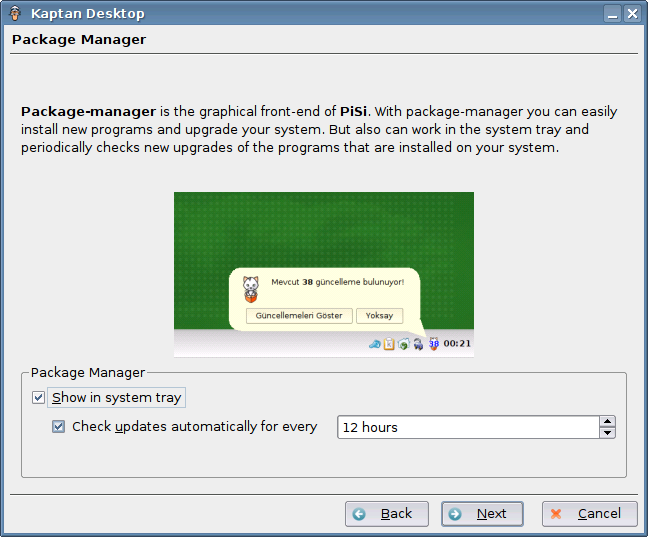 Package manager // The intuitive and cute graphics interface of PiSi makes update and installation of software much easier…..
Fast start-up // The new init system developed using the Pardus configurarion framework ÇOMAR makes the start-up much faster compared to other operating systems…. New and up-to-date applications // More than 640 packages are installed with the CD, and more than 1000 available over the internet. Since Pardus 1.0 more than 770 packages were added to the repo …. Missing Time Zone selection could have been added. Installation duration was 35 minutes including configuration. It seems to be reasonably faster for a PIII system. Pardus’s installer is called as YALI (Yet Another Linux Installer). KDM welcomes us with a nice, clean and professional blue interface with face browser support. I logged in as normal user. In startup there was a wizard called Kaptan Desktop as shown below. The wizard says Pardus targetted at computer literate user. The following are covered in this wizard. 4. Network connection wizard – Not able to enter more than one Name Server since only one text box is given. 5. Package management – Automatic update is configured here. Immediately package manager started updating package database and reported that 127 packages need update. I updated them. 6. TASMA – It is a Pardus Configuration Center tool. It is mostly KDE Control center. 1. Package manager – There are three tabs showing New packages (i.e, packages not available in installation CD), Installed packages and upgradable packages. This is a simple and straight forward tool which works well. I updated all 127 packages through this tool. But the package distribution are all were in Turkish (I guess), not in English. This is important one to take care. Here is the screenshot. It is a front end to PiSi package management tool. The advantage of this tool in my point of view is NO CONFIGURATION DURING INSTALLATION. This is different from debian package management. 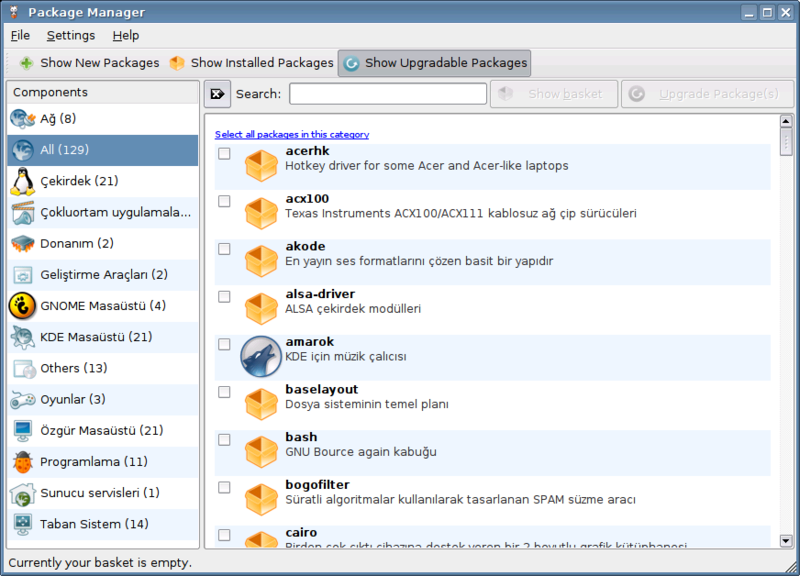 I installed all 127 packages without any manual intervention, which is most useful during night time. For more information on PiSi system, refer here. 2. When I logout, X too terminated and resulted in console only system. This was rectified after all package update and reboot. 3. Though my hardware is legacy not supporting accelerated graphics I was managed to install Beryl with the help of this wiki page. Installation is very simple if you follow this guide. But for regular use, beryl was not usable in my legacy system which does not have rich Graphics card. The following screenshots shows transparent windows and minimize effect on my low end system with some glitches. 4. Pardus takes 40 seconds to come to login window which is a bit slower than Ubuntu. But it is reasonably good performance thanks to mudur init system. It is not replacing the existing init system but mudar is called from /etc/inittab. The /etc/init.d/ has only a few scripts, leaving rest of the initialization in /sbin/mudur.py python script. Basic jobs of initialization, i.e. loading modules, starting udev device manager, mounting filesystems, updating system clock are handled by a single Python script as per wiki. Here there is no easy to maintain modularity when compared with /etc/init.d/<scripts>. 5. Mplayer multimedia codecs, Flash-plugin and Java are installed in default installation from CD media. It is a good news for dial-up users and also saves time to do update. 6. More English documentation is needed. I have not used this Pardus system for my production system. Only a few days I have used this system. I can see a lot of innovation are going on in this project. It is my dare saying that Pardus is worth to watch for further innovation in Desktop Linux. Meanwhile version 2007.3 Pardus “Lynx lnyx” is available. This distribution indeed is as good as openSUSE or as good as Kubuntu, it can be recommended for beginners as well as for Linux-experts. what a great program,..and free codecs flash etc,..
Pingback: Another (nice) Pardus 2007 review « Can K.
I’m running Pardus on my 8-yr-old Gateway desktop. The distro, like so many others, has all the applications I need for daily home use. My young children like visiting pbskids.org, which relies heavily on Flashplayer; so its inclusion on the installation CD was a pleasant surprise. Sometimes the screen will black out and the keyboard dies when I switch users. Has anyone else had this problem? i am doing same work with you.. but i am some collectionist. Pardus is EASIEST distro i ever seen! I’ve just installed Pardus on my notebook. In last 30 days, i used ubuntu, kubuntu, xubuntu, zenwalk, opensuse as linux and pc-bsd, desktopbsd as bsd. Although Pardus uses KDE, it was amazing to see its reboot time is almost equal to xubuntu which is very lightweight ditribution. It recognized almost all hardware, just graphic card sticked to 1280 resolution instead of 1400. IMHO, Ubuntu is the best if you prefer GNOME, but Kubuntu can’t compete Pardus in any way. 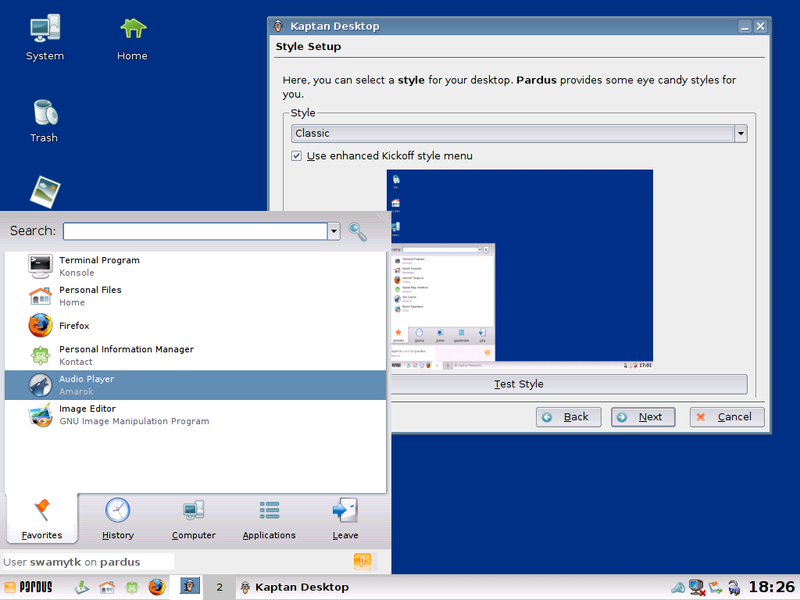 Pardus really is a great distro for KDE fans and has a bright future ahead. Thank you for writing this nice review. 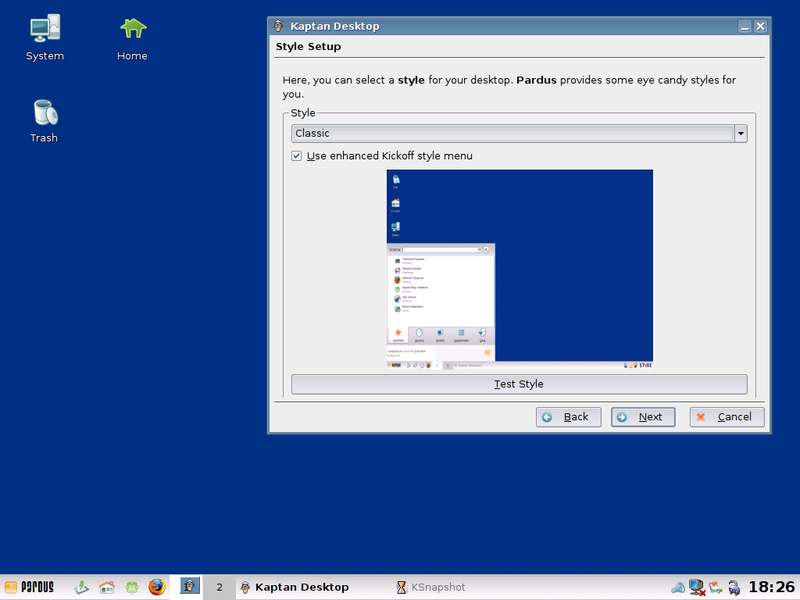 I hope KDE4 has that cool kick style! And Ubuntu with the slick SLED gnome style.